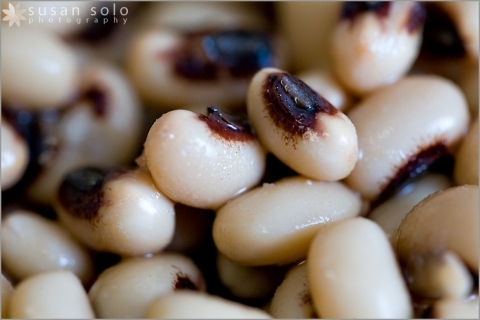 I don’t consider myself to be a particularly superstitious person, but I love fun traditions like eating black-eyed peas on New Year’s Day. Well, I don’t actually love black-eyed peas…in fact, I loathe them. The texture is just gross to me, or maybe it’s the beady little black “eyes” staring at me. But I love the thought of the peas affecting my luck for the whole year. My mom usually served the lucky legumes with our meal on New Year’s Day, but Chris and I tend to just eat an obligatory spoonful, sometimes right out of the Goya can just to get it over with. This year I did put them on a plate with the rest of our dinner (and later photographed them like the dork I am). Do you have any New Year’s traditions? Wishing you and yours peace, love, happiness and lots of luck in the new year!